I was put on WIC and bottlefeeding only my baby at the time. To be honest WIC DOES NOT provide all of the formula needed every month so you have to end up buying at least 3/4 more cans. 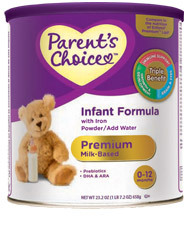 With me being on a budget buying the Parents Choice formula helped saved a lot of money. Your basically getting baby milk half the price and with the same exact ingredients and regular formula. They also have a formula for babies with sensitive stomachs. I highly recommend them. Really affordable and great quality. It doesn't really clump like a few other brands that I tried. My little one seems to enjoy it as well. I bought this formula because i had a coupon. My son liked it and he didn't feel the difference between his old formul a. Easy to mix! It's a great formula for when I can't get our regular formula. My 7 month old seems to like it and has no problems with. It's my go to for when I can't get his normal stuff! Great formula for mothers on a budget ! I used the gentle from for my daughter. I personally loved this formula. My daughter also loved it. It didn't smell as bad as some of the other formulas I tried, it also was easy on my wallet. Both my daughter's loved this formula and it is much cheaper than the big name brands. I did use Infamil for the first 4 months or so and when I gave them this formula they just drank it up without any issues.